Galashiels RFC coach George Graham at Netherdale. Not for the first time in his coaching tenure at Netherdale, Gala coach, George Graham, has hit out against Murrayfield’s policy of allowing professional players to appear in amateur club teams. 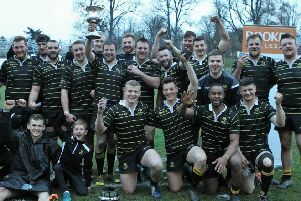 Graham’s Gala side, now fighting to avoid a relegation play-off, faced a Heriot’s team that contained three current professional players and in the end it was a significant factor in the Maroons’ narrow defeat. And it was not just Gala that have been affected, as Graham pointed out with reference to Hawick’s game against Glasgow Hawks a week earlier. “It’s an absolute joke the way things are going,” he said. “Somebody in the SRU thinks it’s OK and fair that five professional players can play for Hawks while Hawick have none. Some idiot thought that was fair and good for club rugby in Scotland. “Last weekend three Border teams didn’t get a single pro player. We’re not happy with that. But we don’t have a say because the people in the SRU are pulling the strings. “The three pros that Heriot’s had today made a difference. Jason Hill is a class player, Jamie Ritchie is a talent and Glenn Bryce is a skilful runner. Take them out of the equation and we were better than Heriots.